At AADI, our Vision lies at the heart of all we do. We keep our Vision simple : Our Vision defines how we perceive ourselves and wish to be perceived by others. It is supported by the values that more specifically define our beliefs, the goals we will pursue to realize our vision, and an operating system that defines the value stream and how it is managed to achieve a set of enterprise goals..
Teamwork : We know that the best ideas and results are created when we work together. Therefore we embrace diversity; we support each other; and we take ownership for the performance of our team and ourselves. Innovation : We understand that it is the creativity of our People is that fuels our growth. We support that creativity through investment, process efficiencies, professional development and knowledge management. Integrity : We will always be ethical and honest with our customers and each other and never compromise the trust placed in us. This includes complying with all laws governing our corporation, our stewardship of the environment and being good citizens in the communities where we live and work. 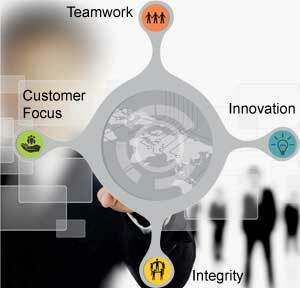 Customer Focus : Our reason for being is to create customer and shareowner value. We achieve this by helping our customers be successful and doing what we say we are going to do.